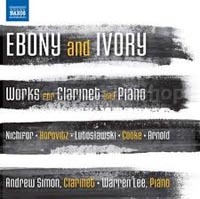 “Ebony and Ivory” is a new release from Naxos of twentieth century music for clarinet and piano. It includes Dance Preludes by Witold Lutoslawski, Joseph Horovitz’s Clarinet Sonatina and Sonata for Clarinet by Arnold Cooke. The performers are Andrew Simon, clarinet, and Warren Lee, piano, who spent time in London last year working closely with Joseph Horovitz prior to the recording sessions. They performed his Sonatina most recently at a Gala Concert in Hong Kong to celebrate Warren Lee’s thirtieth anniversary of his debut with the Hong Kong Philharmonic at the age of six.